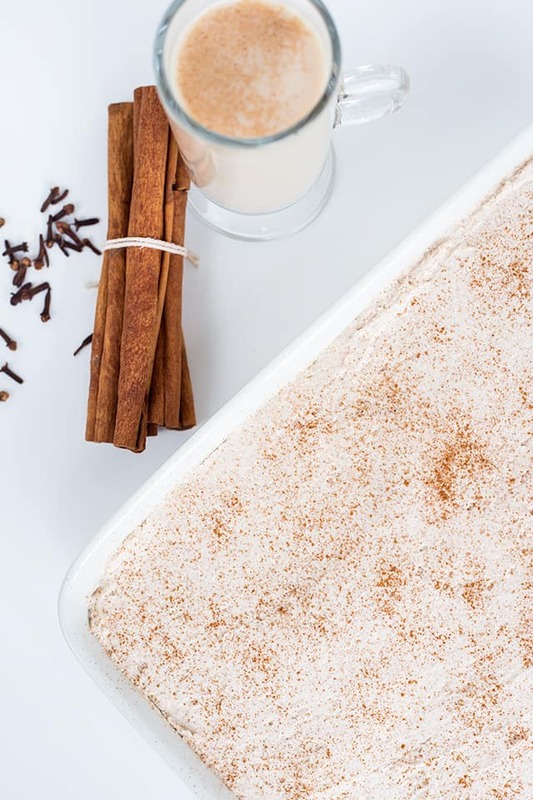 This Chai Latte Poke Cake has a homemade moist, spice cake that’s been infused with Oregon Chai® Tea Latte Concentrate. 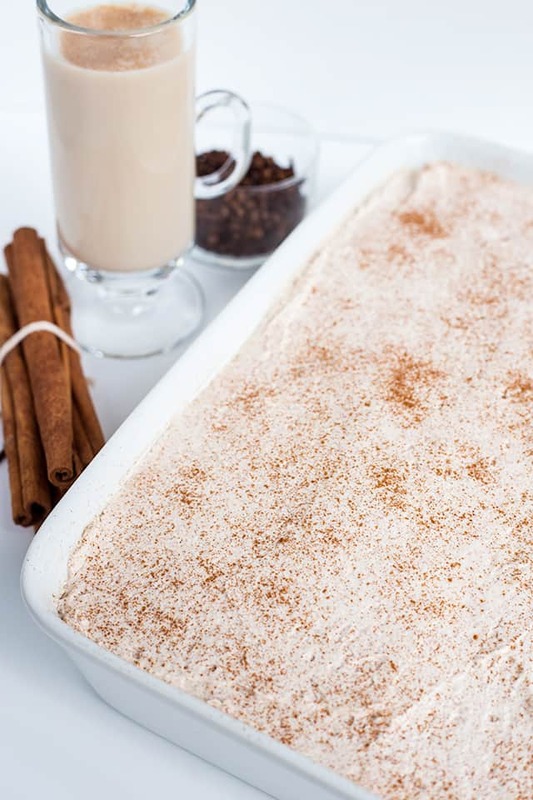 It’s filled with a homemade chai tea latte pudding and topped with a heavy layer of cinnamon whipped cream. It’s the perfect homemade fall dessert! 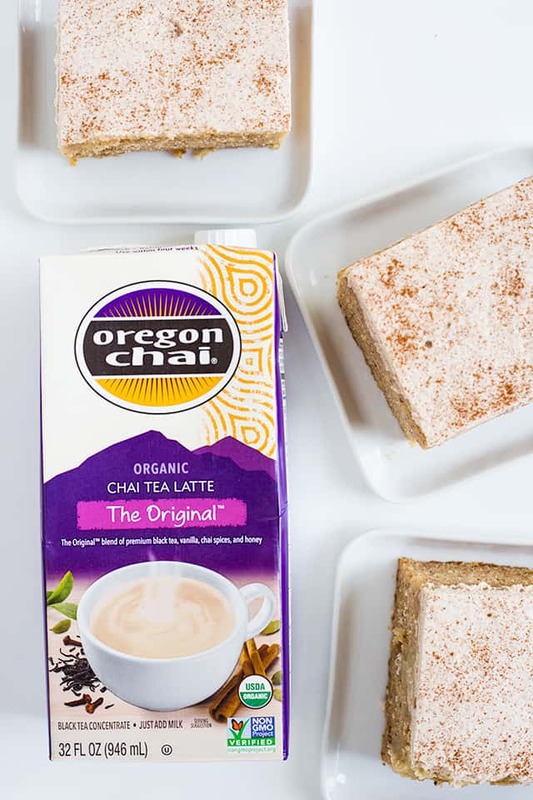 This is a sponsored post written by me on behalf of Oregon Chai®. All opinions are entirely my own. Lately, I’ve been really loving cakes in a 9×13″ pan over the stacked cakes on my blog, especially if I can make them into a poke cake. Now that fall is here, I want to add some fun, spiced up fall poke cakes to my blog. 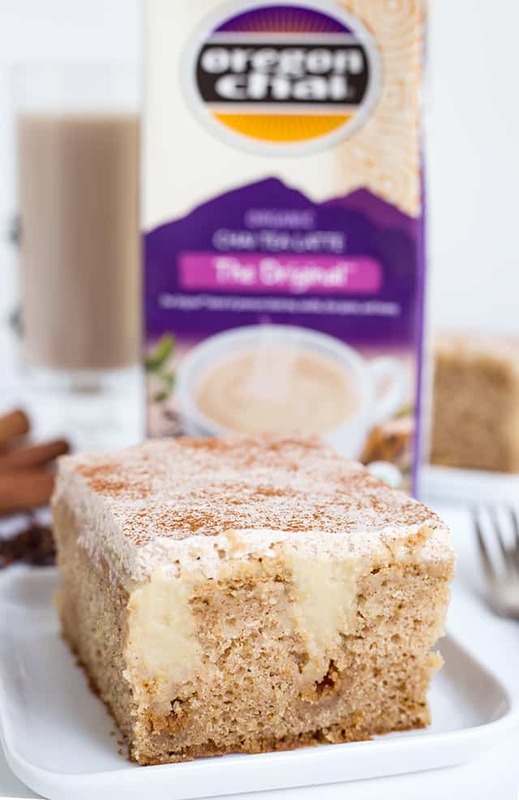 The first idea that popped into my head was a Chai Latte Poke Cake using the Oregon Chai Tea Latte Concentrate from Walmart. The concentrate has all the right spices that scream fall AND to make the perfect spice cake. The flavors that immediately pop out at me are the cinnamon, ginger, and cloves which happen to be the flavors I gravitate to this time of the year. I have so many more ideas for fall recipes that I can use this Oregon Chai Tea Latte Concentrate in. Would you like to see more recipes using it? One of the best things about this recipe is that I can find all of the ingredients at my local Walmart. 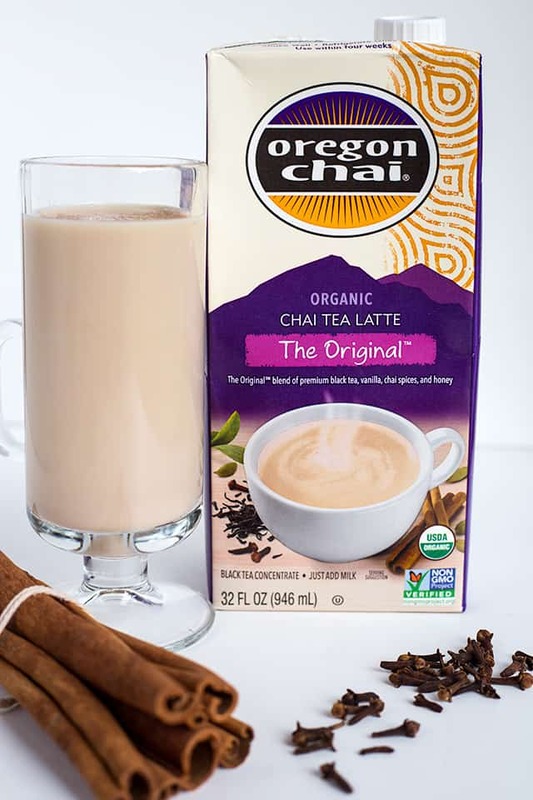 Where can you get this Oregon Chai Tea Latte Concentrate? At your local Walmart, with the tea and coffee. Not only is it high quality, but it’s also organic and Non-GMO Project Verified! 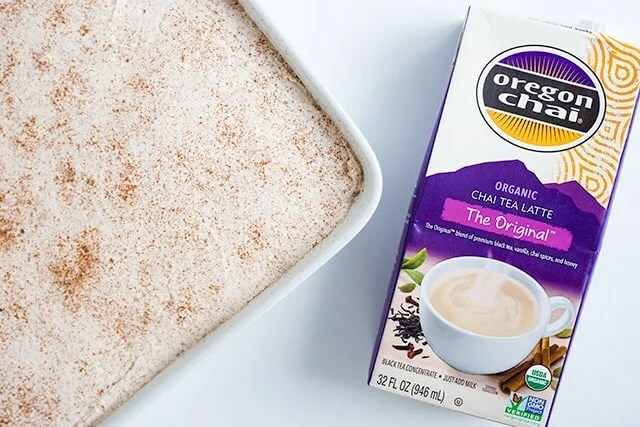 Plus, it’s a great time to buy because there’s currently an Ibotta rebate for 75¢ off any 1 Oregon Chai product at Walmart from 9/26/18-11/30/18, or until supplies last. I want you to be able to enjoy the experience of the rich, soothing mix of sweet and spicy bliss even if you just chose to use it in a glass of milk which is amazing both hot and cold. 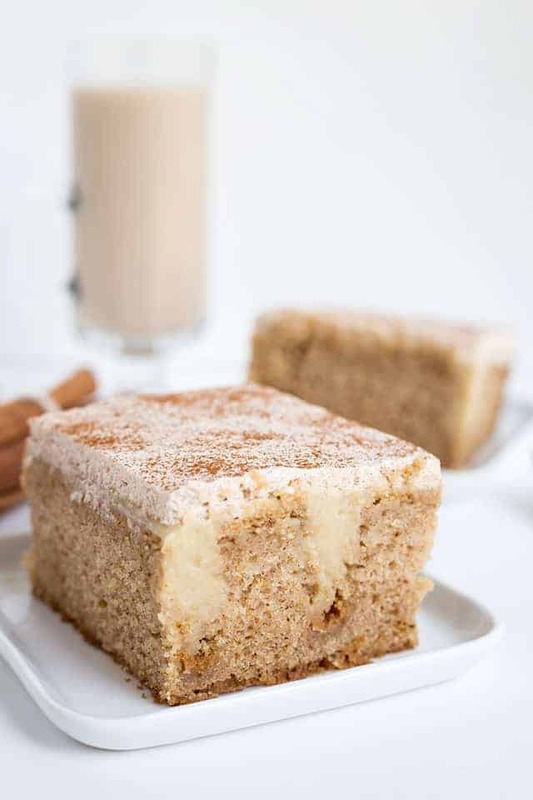 Try it in this cake though, between the homemade Chai Latte Cake and the homemade Chai Latte Pudding, you won’t regret it. It’s so important to enjoy a bit of “me time” before the stress of the holidays gets here. I love relaxing and making a chai latte with Oregon Chai Tea Latte Concentrate. 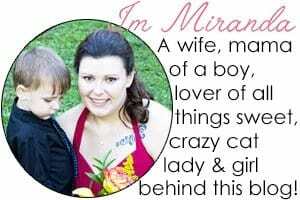 It’s also great incorporated into recipes like I’ve done here. So I love this recipe because you can use your trusty whisk for everything. There’s no need for a hand mixer; not that the hand mixer is that much more work. You’ll need a large mixing bowl and a glass microwave-safe 4 cup measuring cup, or something similar. Let’s start with the dry ingredients so we’re not keeping the wet ingredients waiting and so that the whisk doesn’t get wet first. Add flour, sugar, baking soda, baking powder and all of the spices into the bowl and whisk until it’s combined. That’s it for the dry ingredients. Using the glass measuring cup, add in butter and melt it. Next, pour in the Oregon Chai Tea Latte Concentrate, sour cream, vanilla extract, and eggs and whisk. Add the wet ingredients into the dry and whisk until the batter is smooth and the flour is completely incorporated. Pour it into the greased cake pan and bake. 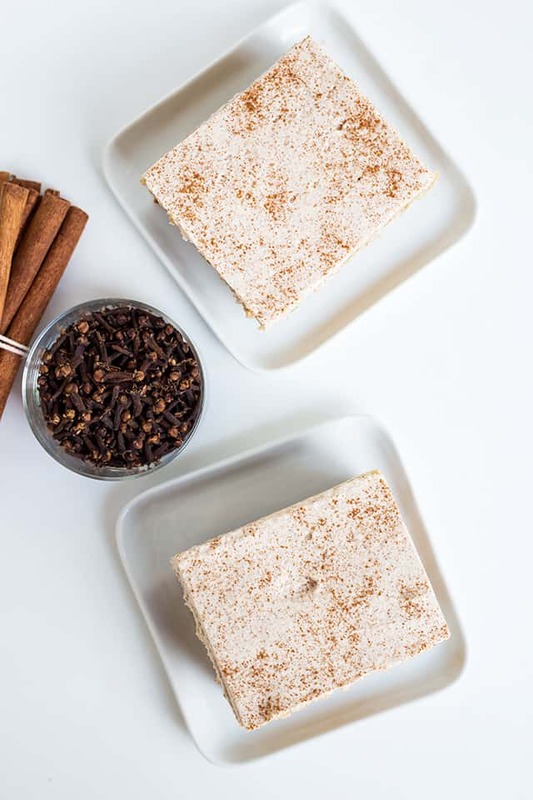 What Spices are in the Chai Latte Cake? 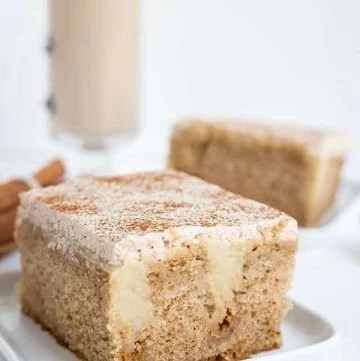 When you bite into the cake, I want it to taste like a spice cake. The Oregon Chai Tea Latte Concentrate provides a lot of chai spice flavor, but I wanted to give it a little extra boost. To do that, I added ground cinnamon, ground ginger, ground nutmeg, and ground cloves. I’ve been hooked on homemade pudding since making the coffee pudding. This Chai Latte Pudding is where it’s at though. The vanilla, black tea, and chai spices all together in a pudding makes me a happy lady. I bet it will make you happy too. The pudding isn’t hard to make at all. The first step is to add the yolks, milk, and Oregon Chai Tea Latte Concentrate together and whisk until combined. Next, grab a medium saucepan, add in the sugar, cornstarch, and salt. Whisk to combine. Pour the liquid into the saucepan slowing and whisk. I add about 1/2 cup of liquid and whisk it in thoroughly to make sure there are no lumps and then add the rest and whisk. Heat it on medium and let it boil for 1 minute until it thickens. As it thickens, you’ll be able to see the lines in the pudding from the whisk. If it hasn’t thickened that much in a minute let it go a little longer (maybe 10 to 20 seconds?) but continue to whisk constantly and watch it closely. 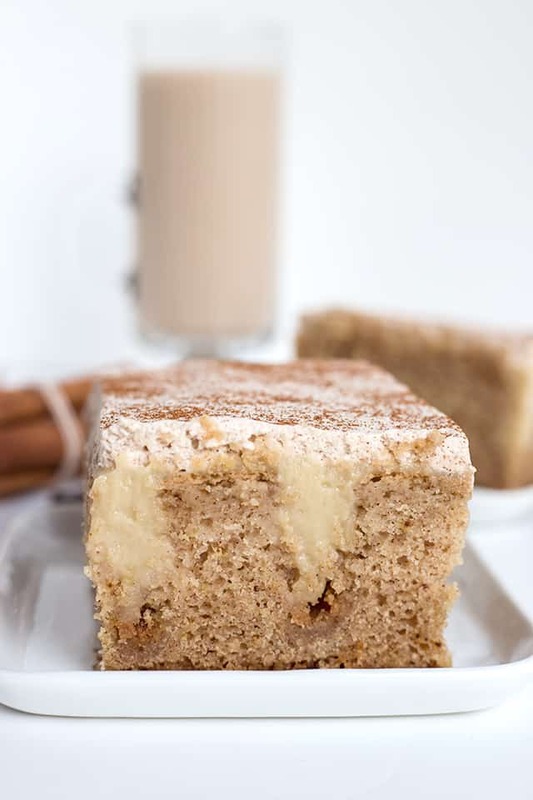 Can you Substitute All-Purpose Flour for the Cake Flour in the Chai Latte Cake? I haven’t tried just swapping it out, so I can’t say for certain that it will work, but I do know if you don’t have cake flour that you can make it yourself. In a small bowl, add in 1 cup of all-purpose flour, remove 2 tablespoons and replace it with 2 tablespoons of cornstarch. Can this Cake be Made into a Layer Cake? Yes! The batter will make 2 thick, 8-inch layers or 3 thin, 8-inch layers. What is Oregon Chai Tea Latte Concentrate? It’s a concentrate that when added to milk is a delicious drink. Use equal parts of concentrate and milk for the best beverage. It can be drank hot or cold! Can I get a coupon for Oregon Chai Tea Latte Concentrate? Yes! 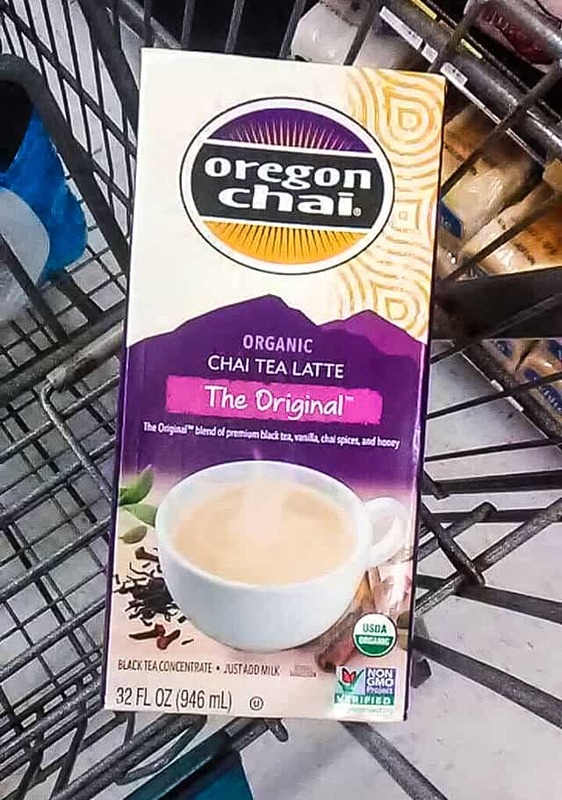 You can save 75¢ on any 1 Oregon Chai product at Walmart from 9/26/18 – 11/30/18, or until supplies last by using the Ibotta app. You can find the rebate here. Preheat oven to 350 degrees F. Spray a 9x13" cake pan with nonstick cooking spray. In a large mixing bowl, add in cake flour, sugar, baking soda, baking powder, salt, cinnamon, ginger, nutmeg, and cloves. Whisk until combined. In a microwave-safe medium bowl, add in the butter. Microwave for 30 seconds to 1 minute. Add in the Oregon Chai Tea Latte Concentrate, vegetable oil, sour cream, vanilla extract, and eggs. Whisk until smooth. Pour the chai latte mixture in with the dry ingredients. Whisk until everything is combined. Try to whisk out most of the lumps. Bake for 40 to 45 minutes or until it's done. Place a toothpick in the center of the cake and if it comes out clean or with moist crumbs it's done. While the cake is baking, prepare the pudding. Let the cake cool completely before doing the next step. Using the round handle of a wooden spoon, begin poking holes into the cake. Do 6 - 7 holes in each row and 8 to 10 rows. In a bowl, add in the lightly beaten yolks, whole milk, and Oregon Chai Tea Latte Concentrate. Whisk to combine. Set aside. In a medium saucepan, add the sugar, cornstarch, and salt. Whisk until combined. This will help prevent the cornstarch from clumping when liquid is added. Add about 1/2 - 3/4 cup of the milk/chai latte mixture into the saucepan and whisk until smooth. Add in the remaining milk/chai latte mixture and whisk. Place over medium heat and whisk pretty constant to prevent the pudding from sticking/ burning on the bottom of the pan and clumps forming. Once the pudding comes up to a boil, let it boil for 1 minute while whisking constantly. The pudding should hold the lines from the whisk. Place a fine mesh strainer on top of a bowl. Pour the pudding into the strainer and tap out the pudding. Avoid pushing the pudding through the strainer because the bits of eggs will push through too. Place the plastic wrap on the surface of the pudding. Place in the fridge until it cools down. Add the cooled pudding into a storage bag or a disposable piping bag. Cut the corner or tip out of the bag. Make sure it isn't too big of a hole, you'll want to have control of the pudding coming out. Fill the holes in the cake with the pudding. Squeeze any remaining pudding on top of the cake and spread out with an offset spatula. In a mixing bowl, add in the heavy cream and cinnamon. Beat on medium with a hand mixer until soft peaks form. Add in the powdered sugar and continue to beat on medium until the whipped cream becomes stiff. Add dollops of whipped cream on the top of the pudding layer. Using an offset spatula, begin spreading out the whipped cream until it's evenly distributed and completely to the edges and corners. Cover and chill in the fridge to let the pudding firm up.